Sales of the Nano surged more than tenfold in December from a month earlier. MUMBAI (Bloomberg) -- Tata Motors Ltd.'s Nano, the world's cheapest car, went on sale nationwide in India Monday after lengthier warranties and easier financing helped sales rebound from a record low. The Nano will be available through Tata's 874 outlets across the country, the Mumbai-based automaker said in a statement Monday. Sales had been limited to 12 states as the company worked through initial orders and ramped up output at a new factory. Sales of the Nano, which costs as little as 137,555 rupees in New Delhi, surged more than tenfold in December from a month earlier after Tata began television advertisements, added more sales points in smaller towns and introduced a 99 rupee ($2)-a- month maintenance option. Sales had fallen on a month-on-month basis since July because of price increases and safety concerns following at least three fires. Sales last month rose to 5,784 from 509 in November, according to a Jan. 1 statement from Tata. The December tally, a 60 percent increase from a year earlier, was below the 9,000 monthly sales record achieved in July. The automaker in December lengthened warranties to four years or 60,000km (37,282 miles) and added the maintenance plan. 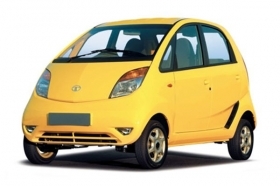 It also started offering as much as 90 percent financing on the Nano through unit Tata Motors Finance Ltd. The company opened a factory in June with the capacity to build 250,000 Nanos a year. Tata's total vehicle sales, including trucks and buses, rose 31 percent from a year earlier in December to 67,441, according to the statement. The automaker was littled changed at 1,308.45 rupees at the 3:30 p.m. close of trading in Mumbai. The shares gained 65 percent last year, the second-best performance in the benchmark Sensitive Index of the Bombay Stock Exchange. The company separately raised prices for some passenger-vehicle models and all commercial vehicles from Jan. 1 because of higher costs. Prices for Indica and Indigo cars rose by as much as 15,000 rupees, the automaker said in a statement. Commercial-vehicle prices increased by as much as 30,000 rupees. Nano prices didn't change. Tata in November said it would retrofit Nanos with additional protection in exhaust and electrical systems after the fires. Investigations concluded that the reasons for the fires were “specific” to the cars involved, the company has said. The November sales tally was the lowest for the Nano since the 624-cc car went on sale in 2009. Ratan Tata, the automaker's chairman, decided to develop the car after seeing a family riding on a scooter.